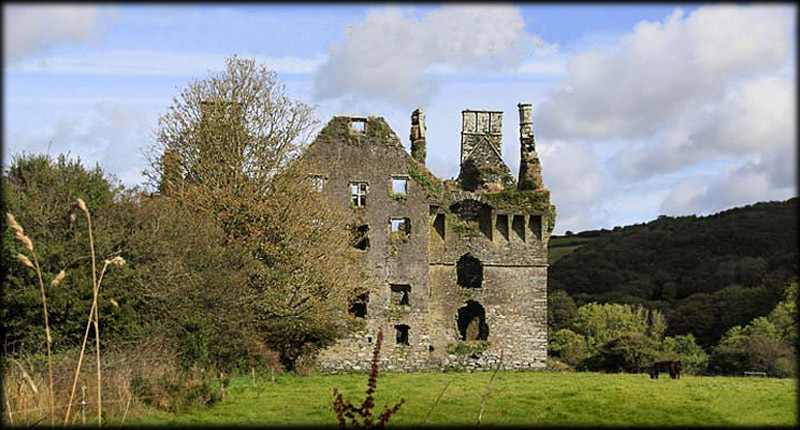 This impressive multi-sided three storey ruined stronghold was built in the fertile Ballyvirine valley west of Rosscarbery by Sir Walter Coppinger shortly before 1616. The house is rectangular in plan, with two wings projecting from the eastern wall and another centrally aligned wing from the western wall, creating a total of 9 gables. The walls are wondrously filled with large windows, some at the highest levels still containing mullions and hood moulding. 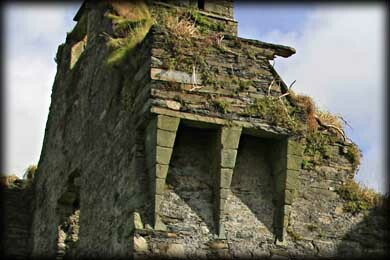 There are two sets of well preserved triple chimney pots and another single, a string course midway up the walls, and the wings have corbel-supported bartizans at parapet level -- all which add to the feeling of opulence. This noble-appearing ruin is sure to spark your imagination and well worth a short excursion into the valley to explore it. It is believed Coppinger was a well-known moneylender who acquired this and other large estates by assuming the mortgage, and that he intended to build a town at the Coppinger's Court site based on the harbour at Millcove. This plan brought him into conflict with traditional rural ways. He is therefore remembered, probably wrongly, as an awful despot who lorded it over the district, hanging anyone who disagreed with him from a gallows on a gable end of the Court. His plans were thwarted when in the 1641 Rebellion the house was ransacked and burned. Legend has it that before leaving to settle a dispute with a neighbour, Sir Walter Coppinger instructed his servants to set fire to his house if he didn't return by a certain time. Sir Walter won the dispute, but forgot his instructions, so when he arrived home full of fine wine and food he found his house in flames. Situated: From the Celtic Ross hotel in Rosscarbery head west on the N71 for 450 metres. Turn left onto the R597. 1.6 kilometres turn left. 700 metres turn right. Coppingers Court is 650 metres up here on your right. Discovery Map 89:W 2603 3597. Last visit Sept 2012.